I like to serve this ceviche with either fresh cucumber slices or the Primos’ Paleo Tortilla Chips! Step 1 Using either a glass or ceramic dish, add your fish, red onion, tomatoes, jalepeño, salt and oregano. Step 2 Next, add your lime and lemon juice. Step 3 Place in refrigerator for 3-4 hours, stirring every hour or so to make sure the fish is well incorporated. Step 4 Before serving, fold in avocado and cilantro for a fresh touch. 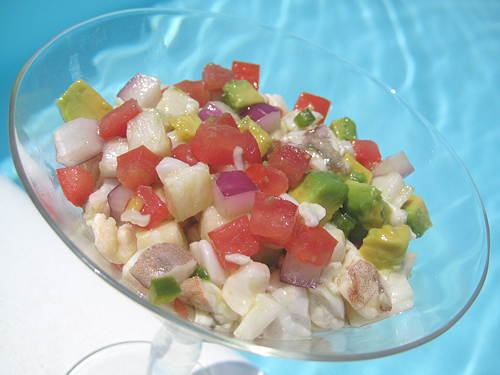 Some people are discouraged with ceviche because of the misconception that the fish is raw. However, as the fish sits and marinades, the acid from the citrus juice literally cooks the fish, making it perfectly safe to eat. 8 Responses to "Paleo Mexican Ceviche"
Looks so delicious! Can't wait to try it! Thanks Catherine! It's perfect on a warm day, really refreshing. The key is lots of citrus and fresh avocado…can't go wrong. Thanks for the tip 🙂 perfect for California summers 😉 You have a lot of great recipes. Hey primos, I traditionally enjoy ceviche with tortilla chips…what do you recommend instead? Karla Campos well you could use: sweet potato chips, sliced cucumber or kale chips….however, I do have a Paleo Tortilla chip recipe coming up in the very near future! Ummm, i thought vegan means no animals… unless I'm wrong.